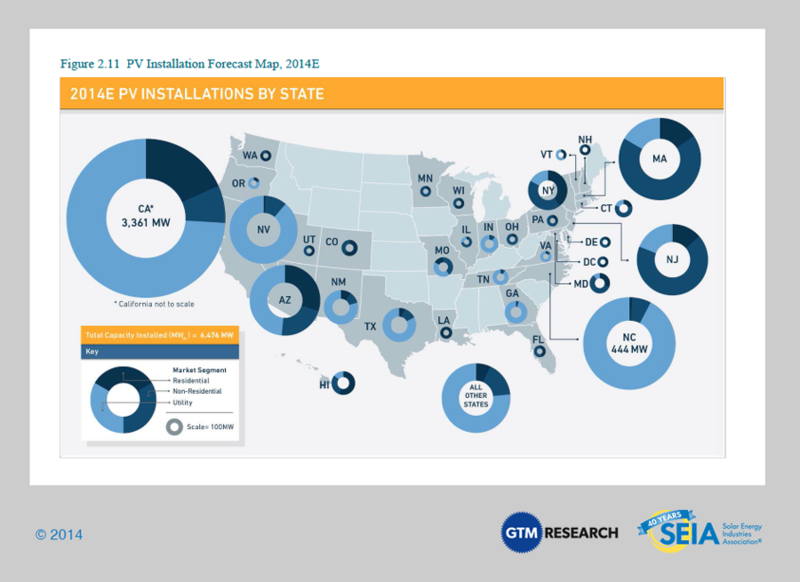 Released in December by Solar Energy Industries Association (SEIA) and GTM Research, the US Solar Market Insight Report Q3 2014 offers valuable and exciting data about the solar industry and trends within the sector. Not surprisingly, 2014 is on track to be the largest year in solar history for concentrated solar power. [Click to Tweet] As of Q3 2014, solar accounted for a substantial portion of new electric generating capacity in the US. 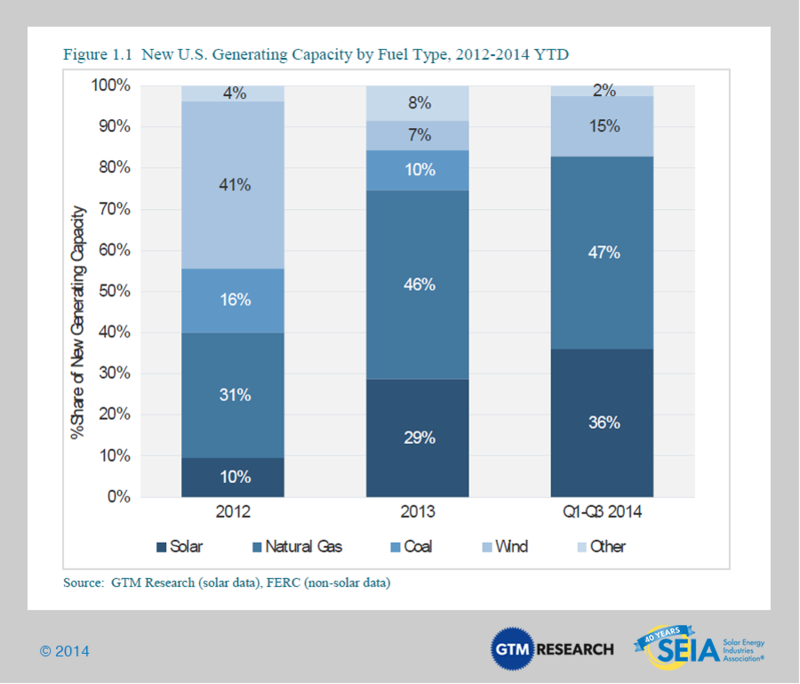 Coming in directly behind natural gas, solar represents 36% of new generating capacity. 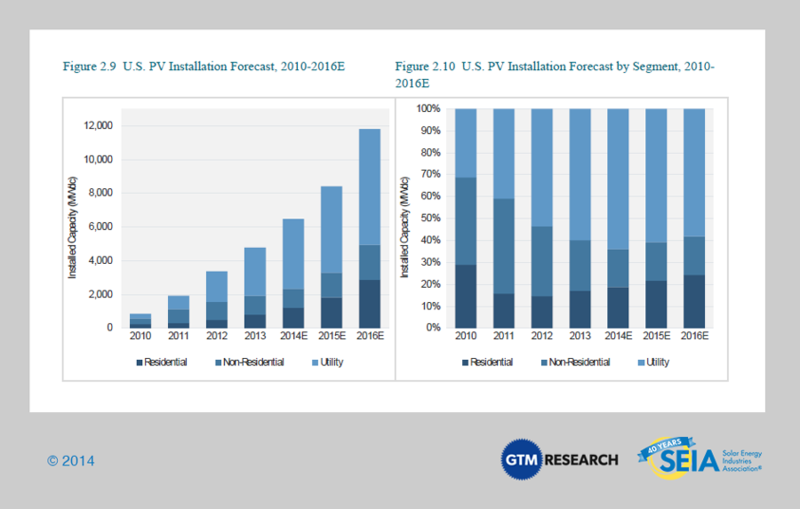 Throughout 2014, the U.S. solar market has seen considerable growth within the residential and utility segments, whereas the non-residential market has “essentially been flat” for the last two years. However, there is promise for non-residential growth during 2015 due to the expansion of the solar market in California, and the development of New York’s solar market. Even in the face of these obstacles, 6.5 GWdc of solar PV installations are anticipated for 2014, which would be a 36% increase compared to 2013’s numbers. 1,354 MWdc of solar PV were installed in Q3 2014. A 41% increase over Q3 2013, making it the second largest quarter for solar installations in the history of the market. Compared to the 2,647 MWdc of PV that went online in the first three quarters of 2013, the first three quarters of 2014 welcomed 3,966 MWdc of PV. Cumulative operative PV capacity has surpassed 16 GWcd. More than 300 MWdc of residential PV came on-line for the first time in history. 50% of this was without state incentive. With the completion of 2014, it’s expected that the final numbers for year will show just how strong this year was. With the residential segment leading the way with a 49% year-over-year increase, the utility segment also had a strong showing with a 45% growth compared to 2013. Although revised, non-residential is also expected to grow, even if it’s just by 1.4%. For further reading, access the executive summary and full report here.